Paul's no stranger to Christianity. He was raised in church with a father that started pastoring in 1949, and continued being the Senior Pastor until his death, 61 years later. Being filled with the Holy Spirit at age 9, he was called into the ministry to preach the Word of God, and several gifts of the Spirit were laid in his life. At age 13, being a 3rd generational minister, he began to minister and by the time he turned 15, he was out in the evangelistic field. The gifts of miracles and prophecy started at a young age, from God healing animals to hurting and diseased people. 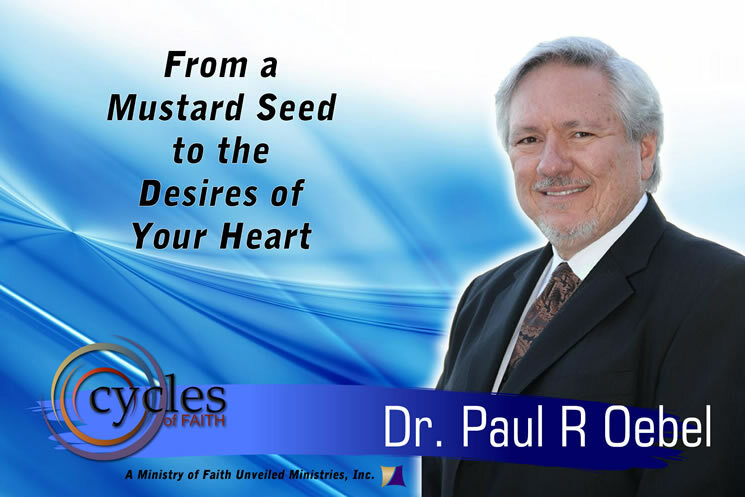 Paul is ordained by 2 organizations and has been awarded an honorary Doctorate of Divinity. On Cycles of Faith, as you follow the show, you'll learn the practical steps to use that will build your faith, and trust in God. Growing up in church, Paul always heard to "have faith and trust in God ..." but was never taught the application of faith. Dr. Oebel will teach you the practical steps, in our minds and in our actions, on how to build your faith.